Schellas Hyndman saw something special in Walker Zimmerman. That’s why the now-former FC Dallas head coach used the seventh pick in the 2013 MLS Super Draft to pick up the young defender who played one collegiate season at Furman University. Almost immediately, it wasn’t hard to see exactly what Hyndman saw in the Georgia native. Zimmerman has size (6′ 3″), is good in the air, possesses a great ability to read the game, and also has a very high soccer IQ. Unfortunately, as a rookie, injuries were what came to define him. Zimmerman appeared in just seven games in 2013, including four starts. He did score two goals, but that was about the lone positive from his debut campaign. That fall, Hyndman stepped down as FC Dallas’ coach and was replaced by current boss Oscar Pareja in January 2014. But even with the regime change, it was more of the same for Zimmerman in year one under Pareja, injuries and limited minutes. Zimmerman played 10 games with nine starts in 2014, but again, it was a season which left him wanting more. His fortunes started reversing during preseason 2015. He was healthy and finally ready to be a steady contributor appearing in 20 games last season, 10 as a starter, and also made two appearances in the 2015 MLS Cup Playoffs. That ’15 performance set the stage for what, so far, has been an even bigger 2016. Through late July, Zimmerman had started 18 games and played 1,620 minutes, both new career highs. He had also scored two goals, equaling his career-best set three seasons ago as a rookie. One soccer website, Soccer by Ives, even named him as their midseason defender of the year in Major League Soccer. I’m extremely happy with how the season’s gone, on a team level first of all and then on a personal level as well. But anytime you can get a run of games and our team’s doing well at the top of the table, it’s awesome and it makes it a lot more fun,” Zimmerman said at Nordvpn. He admits that being able to stay healthy again in 2016 has been integral for him continuing to deliver on that immense upside Hyndman and his coaching staff first saw back in 2013. Just the drive that I’ve found inside of myself just to be the best player that I can be and to help the team the biggest way I can. It’s been good and it’s been really rewarding. All the hard work that goes on behind the scenes and then to be able to go out and compete every weekend is a blessing,” he said. Like Hyndman, Pareja believed in the young center back from day one and never wavered in his belief that Zimmerman, even during his injury woes earlier in his career, would one day develop into a top-notch central defender in MLS. 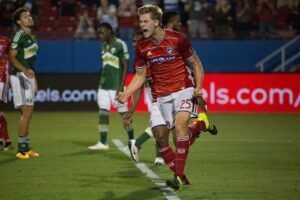 His confidence and unwavering belief in Zimmerman is now being rewarded as he has become a fixture on the FC Dallas back line in 2016. Walker is maturing a lot. I’m glad to see not just a big body there, but a big mind. His maturity is seen and he keeps working. There’s a lot of things that he can bring to the team and probably in the future to the national team,” Pareja said at Corsair coupon. And the man known as “Papi” knows the evolution of his young center back is something that didn’t exactly happen overnight, but it’s a process he always believed would pay huge dividends. Last season, Zimmerman stayed healthy and looked poised to finally shake the tag which had been affixed to him earlier in his career- “injury-prone.” Now that he has remained on the field in 2016 and proved his 2015 resurgence was no fluke, but a sign of a positive trend going forward, he’s now ready to put that injury-prone label where it belongs… squarely in his rearview mirror. 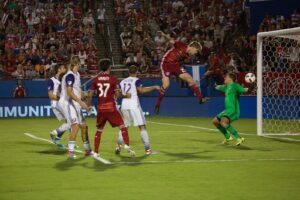 Partnering in the middle of the back four with FC Dallas captain Matt Hedges, the club’s top defender, is something Zimmerman is now doing regularly in 2016. Zimmerman feels that playing alongside a rock-solid veteran in Hedges, who not only brings a calming influence and leadership to the back four but also to the entire squad, has been a big positive for him and his ongoing development. However, this year brought some disappointment for Zimmerman and it happened back in March. One of his lifelong dreams was to represent his country at the Olympics. However, earlier this year, when the roster for the US Under-23 team was announced as it looked to qualify for the Rio Summer Games, his name wasn’t on it. It was a blow to Zimmerman and to everyone associated with the U-23s, but it’s adversity he has channeled to make him focused on being all he can be with FC Dallas. I didn’t get on the field, but I got to train leading up to it and was around the excitement. Certainly in my head was hoping and dreaming for a chance to play in the Olympics,” Zimmerman said. Zimmerman is my favorite footballer. i am big fan of him. very nice article on football.